Happy Labor Day! I hope you're having a great relaxing weekend with friends and family. I'm certianly glad that we're welcoming Fall!!! I love this time of year! I've got two fun things to share with you today. 1. A layout that I did for the Page Maps September Newsletter. 2. I was tagged in a blog tour. Let's start with the Page Maps sample. First, I should tell you that I've been getting the Page Maps Newsletter for years. I've always loved Becky's sketches. Every time I open the newsletter I always thought "it would be so awesome too see my work featured in the newsletter"...well, that time has finally come. (kinda nerdy, I know.) I was given this sketch to work with. I was a little panicked when I saw the sketch. It's not my typical style, I don't usually use 3 photos...or circles but I LOVE how my project turned out. See, sometimes it is good to step outside the box and try something new. I changed things up a bit and instead of a patterned paper circle I hand stitched a circle to connect the two photo blocks and ground the title. I used lots of product from Elle's Studio. 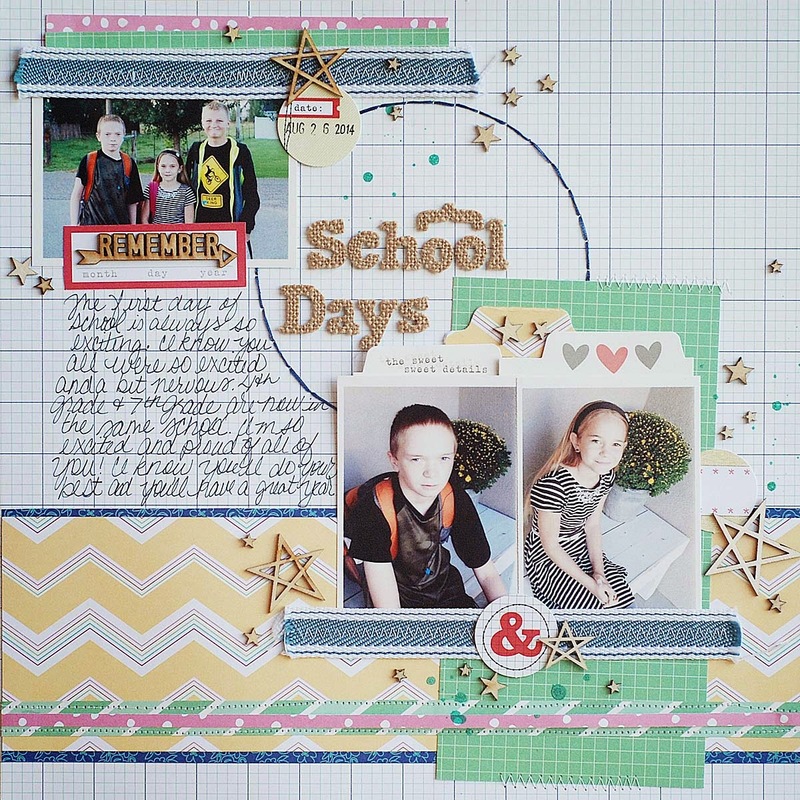 All of the patterned papers I used are from Elle's Studio. 1. What am I working on right now? 2. How long does it take me to create a project? 3. What are my favorite products to create with at the moment? I'm loving all the Fall lines that are hitting the stores. Bella Blvd & Carta Bella are my current favorites. I'm also itching to create with Shimelle's new line as well as the new Christmas line from Pebbles. 4. How does my writing/creating process work? I almost always start with product. It's a little backwards but I love pretty paper and embellishments. I start creating with whatever product I'm loving at the moment and go from there. I have a basket of photos and a notebook of journaling sitting on my desk waiting to go on layouts. When I get about halfway through the layout I add my photo and place my journaling. 5. How do I become inspired and stay inspired? I keep taking photos to stay inspired. I loved photos! 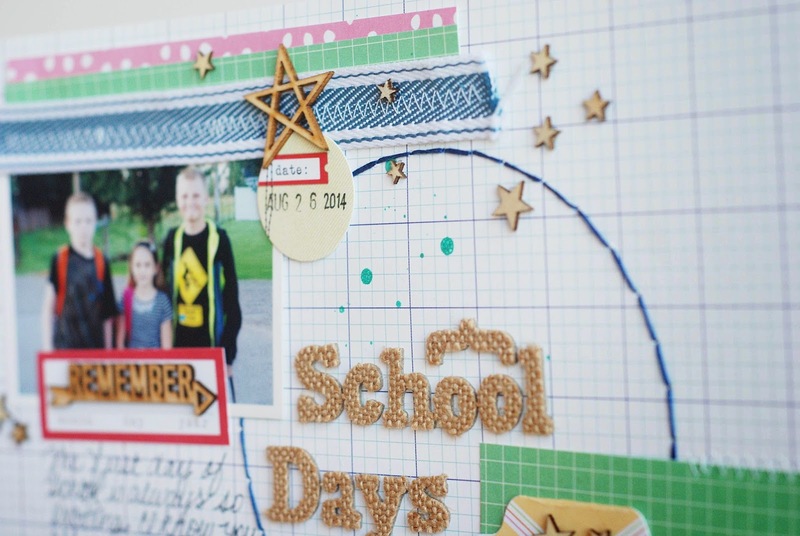 I also try to scrapbook photos soon after I take them. I like to scrapbook a photo while the story is in my mind. If I know I'm not going to be able to sit down at my desk for a few days I write the story in a notebook and put it on my desk so I will remember it. 6. What is my signature style? I usually describe my style as bold, colorful, clean, and classic. I think my signature is using patterned paper. I love patterned paper. Embellishments are fun but I'm always drawn to the patterned papers. 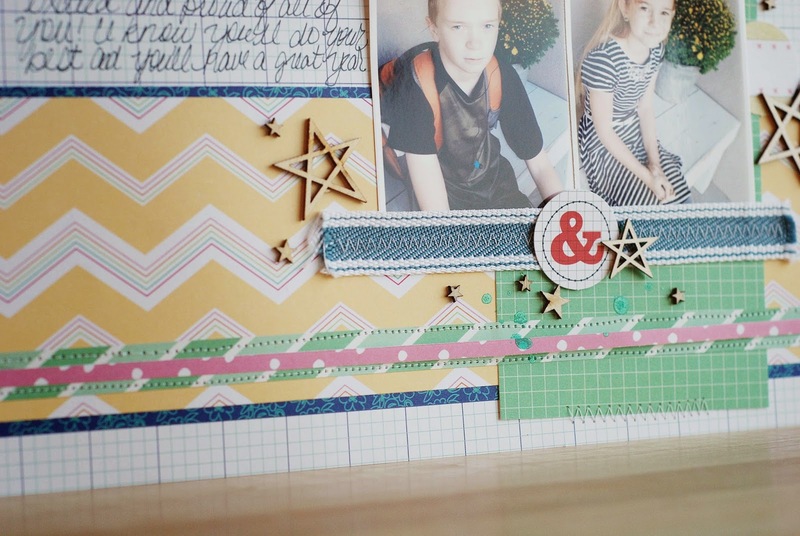 I almost always use at least patterned papers on each layout...sometimes more.